Home | Restauracja i pensjonat "Dwór Dobarz"
Your dreams will come true here! 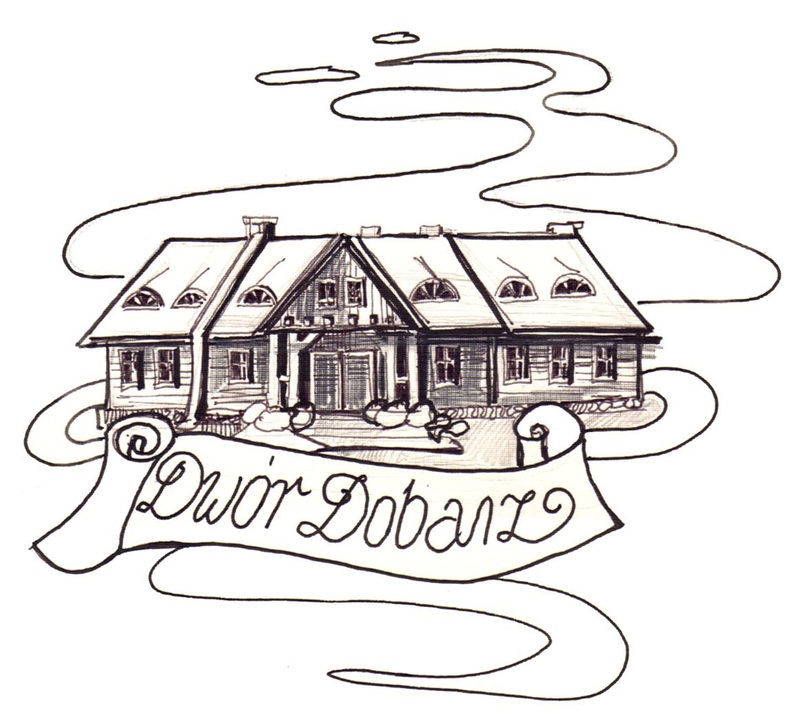 Dwor Dobarz has been designed as a traditional Polish manor house. It is constructed of logs and topped with a gable roof covered with aspen wood shingles. Following the local tradition, stairs are made of split stone. Finishing details of the elevation are patterned on the Podlasie region woodwork. Internal design of the hotel rooms and restaurant includes old furnishing, dowry chests, sleeping benches and weaving looms. For many years owners of Dwor Dobarz have been searching for mementos of the past in attics of the houses in the neighbouring villages in order to recreate a specific ambience of the old borderland manor house. Dwor Dobarz has been carefully and harmoniously integrated in the landscape of the Biebrza region. It is situated by the Tsar Road – a historical tract crossing the Biebrza Marshes and built at the end of the nineteen century. Dwor Dobarz is situated in the heart of the Biebrza National Park and harmoniously and carefully integrated in the landscape of the Biebrza region. It is a perfect place for wildlife watching. We use traditional regional recipes. Dwor Dobarz has been constructed from the grounds by our family. Come and meet us. We hope you will feel like home here. We have been providing the highest quality services for more than ten years. With our assistance you will experience a great wedding reception, any other special event or a team-building meeting. You will certainly find something attractive. If you are looking for a great place for a wedding reception or a memorable family event along with delicious regional food, Dwor Dobarz is a perfect choice. Conferences, business workshops and company events in a distinctive setting and place? You have come to the right place! Szukasz wyciszenia, spokoju i kontaktu z przyrodą? “Przystanek Laskowiec” przy wjeździe do Parku Narodowego to miejsce idealne dla Ciebie..
Our cuisine is based on seasonal natural products from the neighbourhood. Along with our own recipes, they guarantee the highest quality of food. B2B starts from just 85 PLN per person! Every room with a bathroom, Wi-Fi and… breakfast! Dwór Dobarz… Nature at your fingertips…. Find out more about the activities available in Dwor Dobarz. We take care of your needs and do everything to satisfy them. Wi-Fi available for our guests with no additional charges. Dwor Dobarz is fully adapted for the needs of the disabled. If you have any questions regarding our facilities, please contact us. For your comfort we offer rooms with superior bathrooms fitted with baths or showers. Localization of Dwor Dobarz is undoubtedly its greatest advantage. Some of rare species, such as wolves, European eagle-owls and black storks, can be observed here. Apart from activities available all year round, we also offer seasonal ones, such as sleigh rides and fishing in our pond. Baza noclegowa przy wjeździe do Biebrzańskiego Parku Narodowego – najwększego Polskiego Parku Narodowego. Szukasz ciszy, spokoju oraz kontaktu z naturą tuż za oknem Twojego pokoju? Zapraszamy! Don’t think twice, just visit us today!